The Alternative Technologies Fair was held March 22. 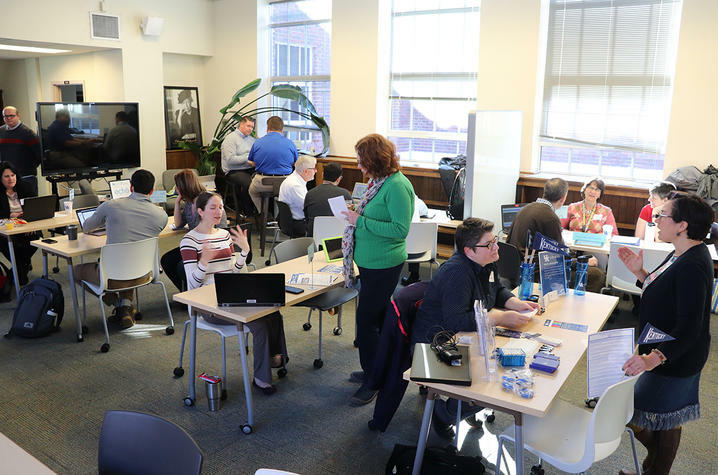 LEXINGTON, Ky. (April 11, 2019) — On Friday, March 22, the University of Kentucky's Academic Computing Committee (ACC) in collaboration with Teaching, Learning, and Academic Innovation (TLAI) and Information Technology Services (ITS) hosted the Academic Technologies Fair. Presenters from across the campus were on hand to show faculty the advancements in technologies available for teaching. Visitors to the fair spoke with presenters on topics ranging from Canvas tools, iClickers, Echo360, ExamSoft, PlayPosit, to Qualtrics and Microsoft OneDrive. The full agenda can be found here. Plans are to host an event again next year, watch for announcements here.